YOUR PRODUCTION BEGINS RIGHT NOW. Let's create a detailed line-item budget for your film, episode, or series — a budget you can hand to investors, impress your crowdfunders with, or just use as a blueprint to actually produce your project. We'll then feed the answers you provide into our budgeting algorithm, which calculates the type of film you have, then assembles a budget using the latest costs for gear, rentals, labor rates, union rates (if applicable), fringes, contingencies, and more. BELOW, select what kind of project you'd like to budget for and then click NEXT. Please make sure this is a working, valid e-mail address and that our email address support@filmbudgeteers.com is not being blocked or marked as spam by your email provider or your email software. No dollar signs or commas allowed. Minimum 10000. Maximum 300000000. Numbers will be rounded to the nearest increment of $1,000. What do I enter here? In this box, enter the total amount you’d like to budget for your film. Our algorithm will then divide that amount up into line items in your budget, based on how you answer the next few questions. But, wait. I don't know what my total budget is supposed to be! If you don’t know what budget amount you’d like to create a budget for, you’ll need to do that first. Nearly all film and TV productions are greenlighted (approved for production) based on a budget amount that the producers say they can deliver the finished project for. Independent films are no different. Film investors will want to see a specific budget amount before putting any cash into a project. Um...how many zeros do I type? STOP. Please enter a number 10000 or higher. How would you like to budget your series? In this box, enter the total budget of the episode. We will then divide that amount up into line items in your budget, based on how you answer the next few questions. If you don’t know what budget amount you’d like to create a budget for, you’ll need to do that first. Nearly all film and TV productions are greenlighted (approved for production) based on a budget amount that the producers say they can deliver the finished project for. Independent series are no different. Investors will want to know a budget amount before putting any cash into a project. STOP. Please enter a number 10000 or higher in the above budget field. (OPTIONAL) For example, if this is episode 1, enter "1." Or you can enter "Pilot," or just leave this blank if you want. STOP. Please enter a number 10000 or higher in the budget field above. The number of episodes you enter here will be the amount we divide your budget amount by. This will provide you with a “budget per episode” total which we include on your topsheet along with the budget’s overall series budget total. If you don't have a director attached yet, feel free to skip this and we'll leave it blank. For series, we're not going to enter a director name, as there may be several directors on your series. But don't worry. Your budget will include director costs if applicable at your budget level. How many writers would you like to budget for? In the box above, enter the number of writers you’d like to budget for (0-4). Then, in the boxes below, you can enter the names of the writer(s), or just leave them as “Writer 1,” etc. Whatever names you enter will appear in the budget under the writers line items. In the box above, enter the number of producers you’d like to budget for (0-4). Then, in the boxes below, you can enter the names of the producers(s), or just leave them as “Producer 1, Producer 2,” etc. Whatever names you enter will appear in the budget under the producers line items. Do I enter UPM / Line Producer here? No. Just use the default allocation.Yes. I'd like to tailor those categories myself. For example, if you’d like to budget heavily for Principal Cast so you can afford name talent, but your project has very few stunts and absolutely no special effects, you would want to put the majority of your points into the Principal Cast box, a few points into the Stunts box, and zero points into the Special Effects box. What happens if I select YES above? If you select YES, we’ll ask you to allocate 10 arbitrary “points” to the six specific categories (Principal Cast, Visual Effects, Special Effects, Makeup Effects, Stunts, and Animals) in order to more fully customize your budget to fit the kind of film or series you’re making. What happens if I select NO above? If you select NO, we’ll just use our default allocation for your budget. Which means we will assign your 10 customization points in a way we feel is probably a good mix for most projects: 4 points for Principal Cast, 3 points for Visual FX, and 1 point each for Stunts, SFX, and MUFX, and 0 points for Animals. What happens if I select YES and assign all 10 points into just ONE of the six categories? If you put all 10 points into one category, the other categories will be budgeted at ZERO. How many of your 10 customization points would you like to allocate towards the Principal Cast budget? What do you mean by Principal Cast? Principal Cast are any featured or main characters or name talent/stars you’d like to budget for. If your project’s financial success is dependent on securing name talent, we recommend allocating at least a few points here. Don’t worry. Even if you enter 0 here, we will still budget for Supporting Cast later. How many of your 10 customization points would you like to allocate towards your Stunts? What are considered to be Stunts? Stunts are anything that require a stunt performer to execute in order to maintain maximum safety for cast and crew. Stunts aren’t just car chases and crashes and falls off buildings. They also include punches, falls off chairs, and often seemingly minor physicality that can prove quite dangerous if not performed by a professional stunt performer. How many of your 10 customization points would you like to allocate towards your Special Effects? What are considered to be Special Effects? Special effects are effects that are achieved practically and/or live in front of the camera. They’re generally things like pyrotechnics, explosions, puppetry, weather effects, and squibs. Please remember: Special effects are different from computer-generated and/or Visual effects. How many of your 10 customization points would you like to allocate towards your Make-Up Effects? What are considered to be Make-Up Effects? Make-Up Effects are practical, physical effects created with makeup and foam latex and other materials. They are not computer-generated effects. Make-up Effects often includes monster and alien prosthetics, old age makeup, fat makeup, etc. How many of your 10 customization points would you like to allocate towards your Animal budget? What goes into a budget for Animals? Trained animals and their care and handling require time and expense, as well as supervision by animal authorities. Whether it’s a room of live roaches or a team of elephants or even a family dog that fetches the newspaper. How many of your 10 customization points would you like to allocate towards Visual Effects? What are considered to be Visual Effects? Visual Effects are effects created by an artist or artists using digital technology. Also known as CGI, or computer-generated imagery. VFX are generally any visual effect created with a computer, either entirely or partially. Computer-generated or augmented creatures, buildings, landscapes, motion capture, laser bolts, muzzle flashes, etc. Looks like you've entered more than 10 total customization points. Please go back through the six categories above and enter no more than 10 total. All six boxes must add up to a maximum of 10 customization points. You've allocated ZERO customization points for all six categories. That's absolutely fine, but our budgeting software has to put that money *somewhere*, so we will place it in Contingency, which may give you a somewhat larger-than-usual Contingency percentage. Keep in mind that all five other categories (Stunts, Special Effects, Make-up Effects, Animals, and Visual Effects) will be budgeted at $0. If that's not what you meant to do, make changes in the boxes above. If that is what you meant to do, hit NEXT below to continue. You've allocated all 10 of your customization points into only ONE category. That's absolutely fine! But please remember that because all 10 customization points are going into only one of the six categories, those other five categories will be budgeted at $0. If that's not what you meant to do, make changes in the boxes above to re-allocate your 10 customization points. If that is what you meant to do, feel free to hit NEXT. You've haven't used all 10 of your customization points. That's absolutely fine! The category or categories you did put points in will receive those budget amounts. If that's not what you meant to do, make changes in the boxes above and re-allocate your 10 customization points. If that is what you meant to do, feel free to hit NEXT. How many Principal Cast would you like to budget for? Principal Cast are any featured or main characters or name talent/stars you’d like to budget for. Whether you’re working with name talent or not, this section will help us determine how much money your budget needs to allocate towards Principal Cast, as opposed to Supporting Cast. You can enter the names of your key characters below, or the names of the actors, or leave the boxes as they are. Fun fact: We’ll be working on your Supporting Cast in the next section. Do Principal Cast members get budgeted differently from Supporting Cast? Yes. We allow more money in your budget for Principal Cast in order to be able to spend more towards name talent or actors with a large number of shooting days. What do I enter in the boxes below? You can enter the names of your key characters, or the names of the actors, or leave them as “Principal Cast 1,” etc. No problem, just enter 0 in the box above. How many Supporting Cast would you like to budget for? Supporting Cast are your non-main roles. They’re not in the film as much as your Principal Cast, and might even just have one day of shooting. You can enter the names of your supporting characters, or the names of the actors, or leave them as “Supporting Cast 1,” etc. Enter the first 20. In the final budget file we send you, you’ll be able to add more line items as needed. No. Just use the default time amounts.Yes. I'd like to tailor these time amounts myself. What happens if I select YES? What happens if I select NO? If you select NO, we’ll just allocate the default of 6 weeks of prep, 6 weeks of shooting, 2 weeks of wrap, and 15 weeks of post. How many PREP / PRE-PRODUCTION weeks would you like to budget for? Prep or pre-production is the time spent getting your project ready to shoot. Scouting and securing locations, breaking down and scheduling the script, building sets, buying or preparing costumes, makeup, vehicles, hiring cast and crew, etc. – all of these are included in prep. How many SHOOTING / PRODUCTION weeks would you like to budget for? Shooting / production is the time spent actually shooting your series or episode. How many WRAP weeks would you like to budget for? How many POST-PRODUCTION weeks would you like to budget for? If so, click on NEXT. If you need to make changes, use the PREVIOUS button to go back. 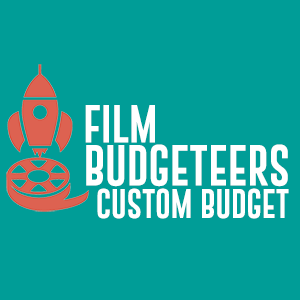 Please select which budget format you'd like and click on "ADD TO CART"
You have selected The Film Budgeteers Budget and Topsheet – In both Excel (editable) and PDF format. You've selected TOPSHEET ONLY. Keep in mind, it's a one-page overview only. If you need a full, detailed budget, please select one of the other options. By completing your order, you're agreeing to our Terms of Service.